This might be the ultimate way to eat baby eggplants. Besides the great classic recipes used for bigger eggplants, like ratatouille, caponata, Baba ghanoush, grilling, stuffing or roasting them( which I love) I feel these dainty two-three inches nightshade gems deserve a more delicate approach. I’m always looking for a contrast in texture when eating something so custardy and creamy like the way the eggplants become when they are cooked. The solution for my craving for these tender and sweet eggplants: tempura batter. I know you have seen eggplant tempura at your favorite Japanese restaurant. They mostly use the large eggplants, which are delicious but not near as delicate in flavor as these babies. Wait until you try this dainty two bite goodness. 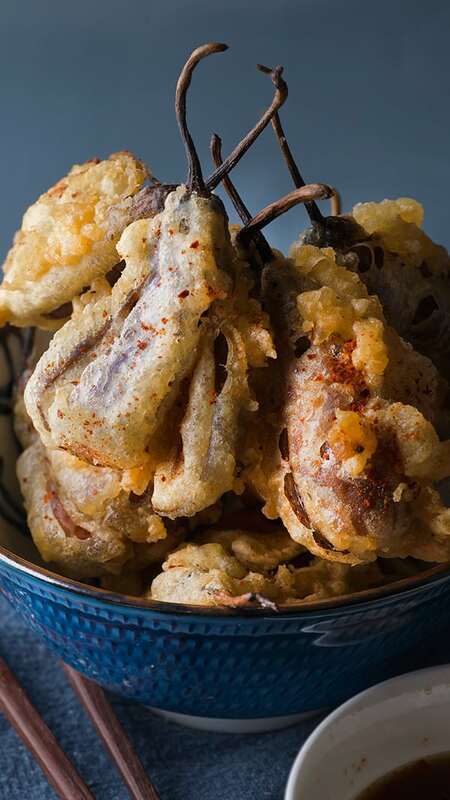 These Tempura baby Eggplants are an exhilarating bite. Imagine a bite that combines a light and crispy fried tempura coat with a warm custardy buttery eggplant interior. A beautiful object to be dipped on a tangy, salty, spicy, sweet sauce. Yes, all in one bite. 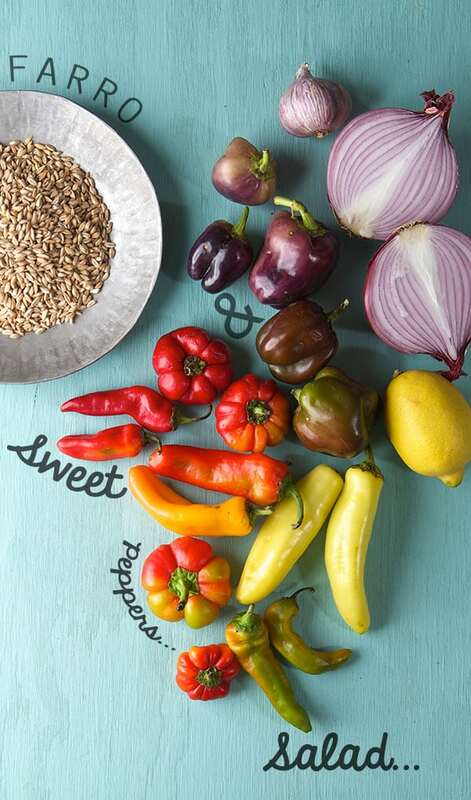 Sweet peppers are what you can find at the markets in Austin, Texas right now. Beautiful varieties, colorful, different shapes and sizes. Perhaps one or two sassy ones among the bunch, but mostly they are fleshy, sweet and flavorful. 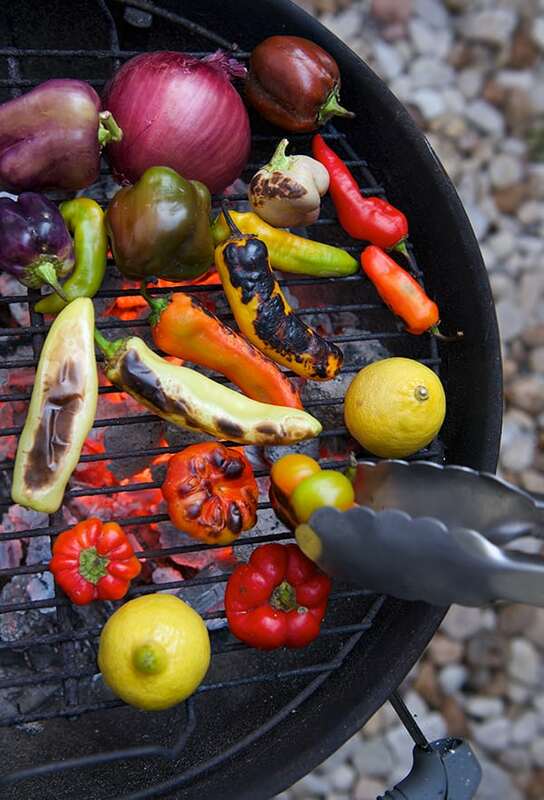 For me, grilling these kind of sweet peppers bring the best flavors in them. The sweet mild flesh with the charred pieces of skin are what inspired me to make this salad. We love to grill at this time of the year when it does not feel like you are grilling your self over, September its a better Grilling Time for us. The noodles in my head are fried. August in Texas is no joke. Our Thermostat is on a bi-polar rampage. We are trying to deny the existence of such a thing called “electric bill”. We better stay still and attempt to use the stove much less on these days. Its sad but true, I’m not even craving BBQ or to go out for lunch or dinner when the temperature outside reads 90 F degrees even at 9:00pm. I’m Summernating! So whats for lunch and dinner these days? The freshest crunchy vegetables, cucumbers, carrots, jicama, crispy lettuce, and thin rice noodles cooked in less than 4 minutes. Summer rolls or Gỏi cuốn which translate in “rice paper rolls, are found all over in East Asia and Southeast Asia cuisine. A fine sticky rice paper is the wrapper which holds vermicelli rice noodles and vegetables. Usually these Summer Rolls are served as a popular appetizer. Odds are you have had them if you eat in Vietnamese or Thai restaurants here in the U.S. But why not make them for dinner as the meal itself? So what are you going to need? You can find the round rice paper at almost any supermarket with an ethnic foods aisle. Or of course you can shop for them in Asian markets or Wholefoods. They are very inexpensive. If you can’t find them, well you can easily order them online if you are Summernating like me. 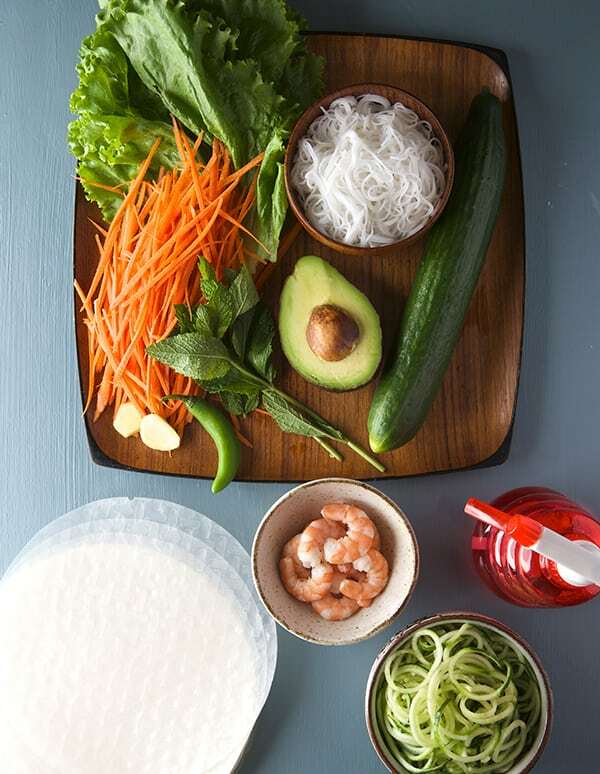 These rolls are filled with julianne fresh vegetables, vermicelli noodles and a lean protein, usually shrimp or pork. I used in-season ingredients like fresh cucumbers which I spiralize to create noodles. If you don’t have that handy apparatus you can use a Juliane peeler or your handy-dandy knife skills to make fine vegetable strips of your carrots and lettuce. 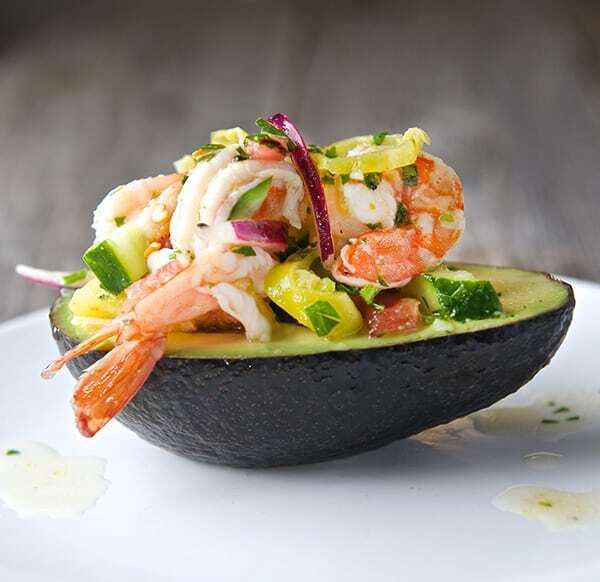 In this version I added avocado and shrimp. In addition of the traditional peanut sauce, I prepared a dipping Mango-ginger sauce to make them fresher and add a bit more sweetness. 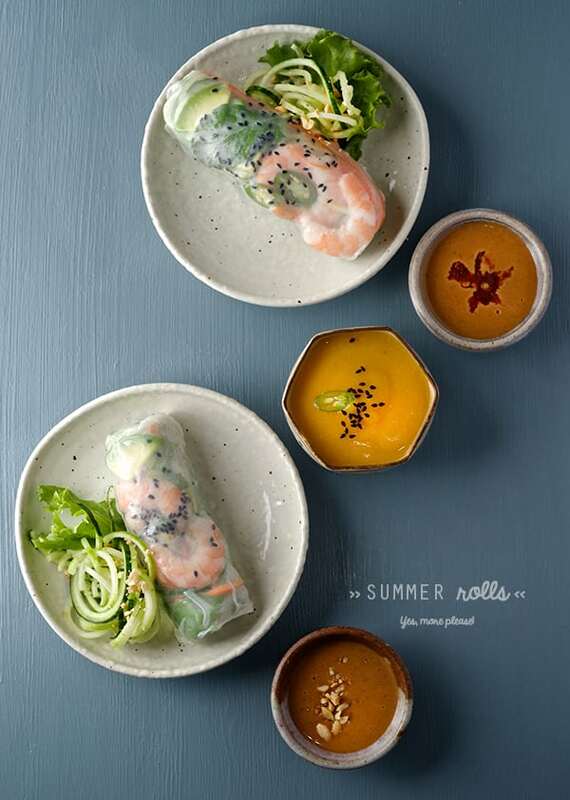 These Summer Rolls are what I’m craving these days. Most of the packages and cookbook instructions out there which (for this roll-up process I call them “des-tructions”) call to dip the rice paper in water, to soften and rehydrate. Then to carefully transfer this world’s stickiest, see-thru, delicate, rice paper film into a wood surface or a plate… Let me tell you, this is sticky fingers, crinkled edges, tear apart of a nightmare. To avoid this situation, I will share with you my secret weapon to make these Summer Rolls, roll easily. 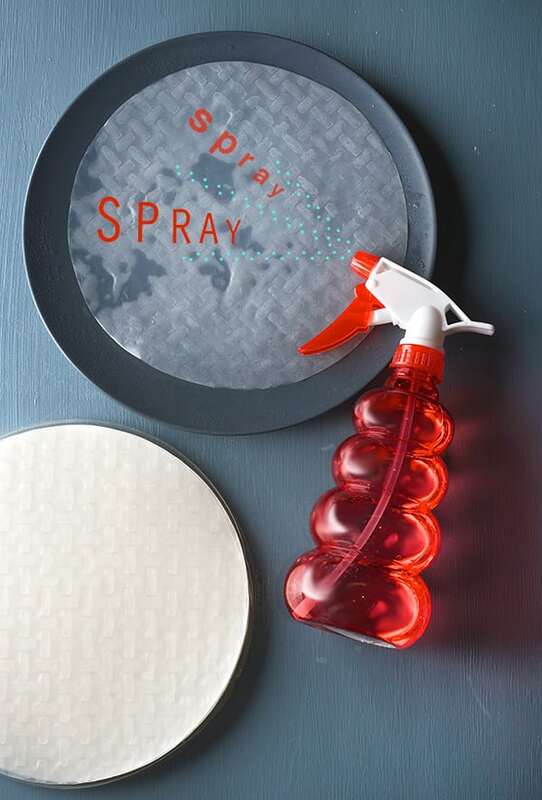 I use a spray bottle. I would say that the closest translation of the word “entomatadas” or “entomatado” would be “smothered in tomato”. 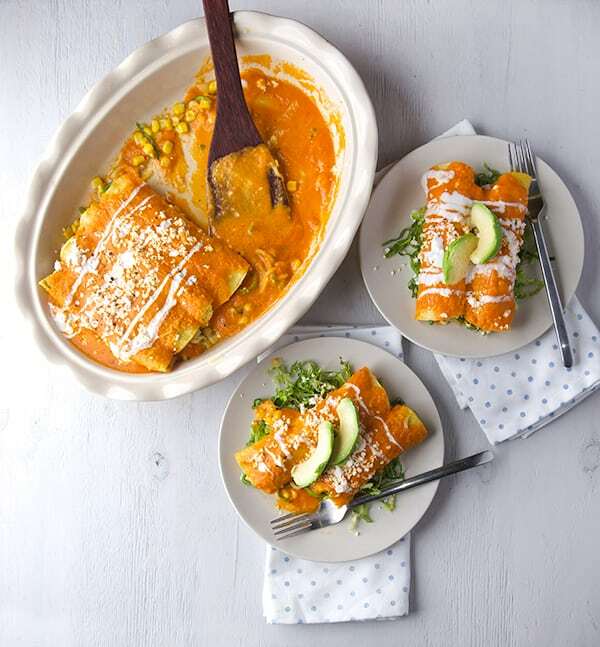 These Entomatadas are the mellow cousins of the Enchiladas. They have the same concept and construction, rolled tortillas filled with infinite possibilities and covered with a sauce made with dry chiles. 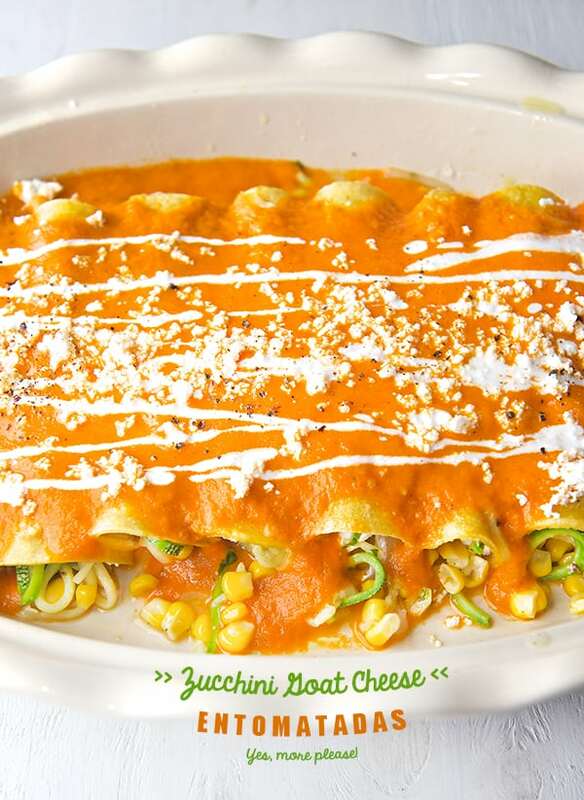 The sauce used in entomatadas is made with red tomatoes, as its name suggests. Roma, or Tomboys tomatoes, or jitomate “bola” in Spanish is usually the tomatoes of choice when making this sauce, but certainly any red round meaty and juicy tomatoes, along with mild herbs and spices will work. 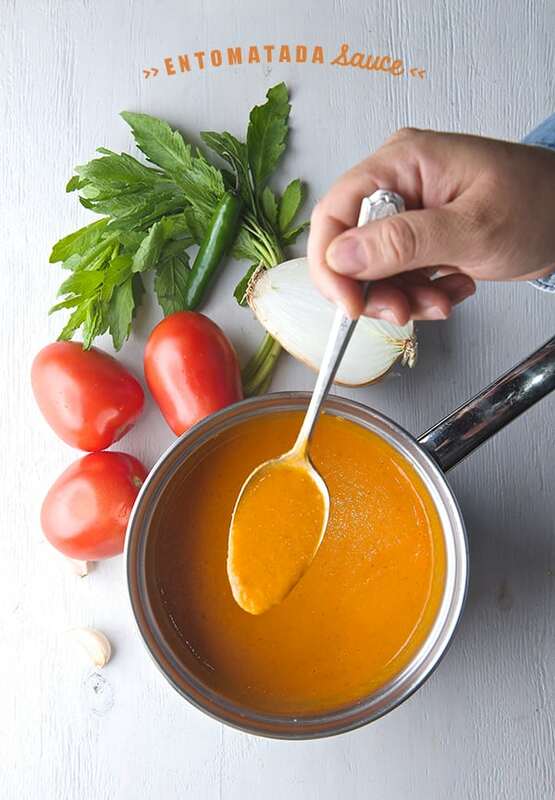 The basic Entomatada sauce is very mellow and showcases the best in tomatoes. In this version of mine, I rock it out a little bit by adding a single serrano, that mimics the black pepper and adds deep of flavor to the sauce. The sauce consist of boiled tomatoes, that are skinned, blended, and then sautéed with onion, garlic and fresh epazote or mint. Then its pureed for a second time to produce the most velvety and creamy tomatoey sauce. The creamy sauce contains no dairy however, which makes the sauce light and fresh. Also on the virtue of looking for a healthier, lighter version of the classic way to make entomatadas which calls for frying the tortillas, I warmed up the corn tortillas and I drizzled them with a bit of a delicious green… a grassy extra virgin olive oil! This step not only adds another layer of flavor, but also prevents soggy tortillas when the salsa is added. These Entomatadas of mine are filled with sautéed zucchinis, onions, sweet corn, and goat cheese. Once I roll them up, they are smothered with the piping hot tomato sauce which warms them through. 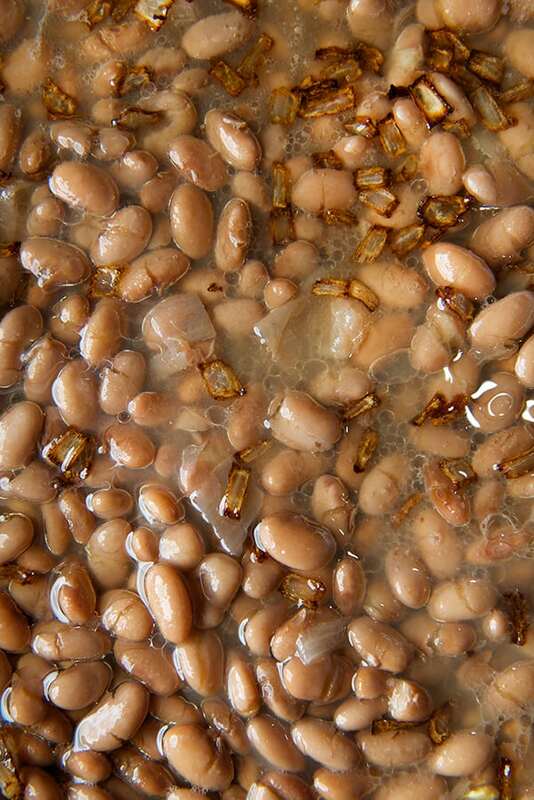 These Entomatadas are best eaten warm almost tepid temperature. Pouring the sauce separately when making any kind of enchilada is my favorite way to make them; It avoids enchilada uni-blocks. Best of all, by using this technique on these Entomatadas, is that it makes them BAKE-FREE!!! keeping you and your house odor free when you have closed the windows to run the A/C. If you don’t understand how that works, then come further South. 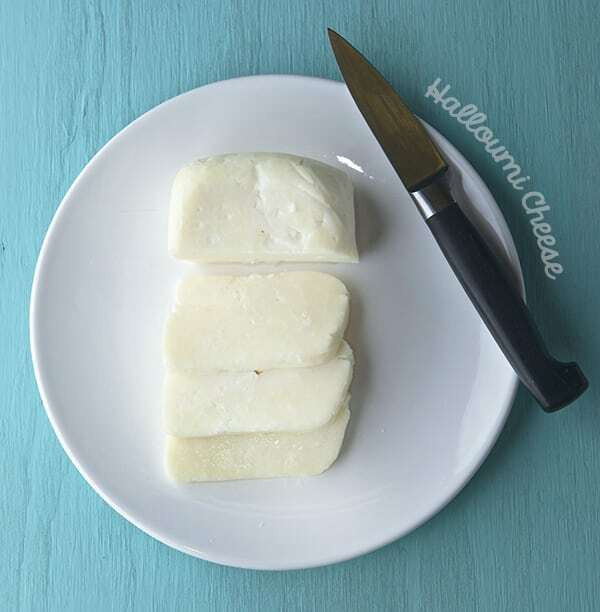 To make this Entomatadas you will need…. 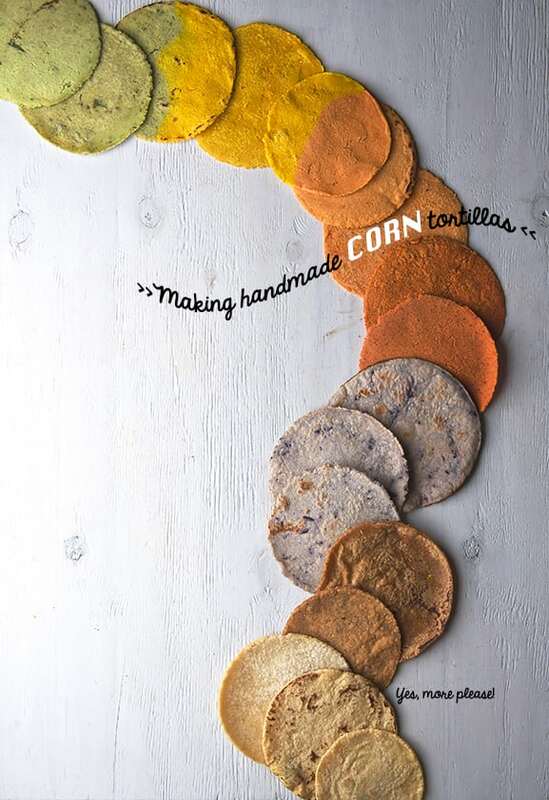 Do you want to learn how to make your own corn tortillas? Get ready! Once you go handmade, its hard to go back to the store bought. The process is fairly easy once you get the hang of it; patience, my little grasshopper, is the key. The first two are horrible, and then the magic happens and you learn from your mistake and “Bippidi-Boppidi-Boo” …your tortillas start to take shape. In the kitchen, making tortillas is one of the things I enjoy the most. Its so rewarding and in my opinion they taste so much better than machine made. Imagine the smell of warm corn filling up the kitchen and the taste of soft fresh tortillas…it has no comparison. Making tortillas requires lots of patience and “patience”. Yes, if you have patience and a little extra time, go for it! Make them because its 100% worth it. Although I recommend you do not attempt to learn how to make them the night before if you have a big crowd to feed or a party… to do so would be a bit of a nightmare. You do need practice and like I said LOTS of patience. Tortillas don’t like people in a hurry. You have to be in a Zen tortilla mode, focus and get into the groove. It can be frustrating at the beginning. Just like pancakes usually the first one is not so good but once you get the right amount of heat and rhythm you are in tortilla mode. Soon after a heavenly bite of a soft corn homemade tortilla, this will become the best taco you ever had. Now, please follow these instructions carefully. I experimented with several proportions and these were the most successful. It is hard to make a tortilla from fresh masa, the procces is labor intensive, it takes about 2 days to make good fresh masa. From the process of nixtamalization, the grinding and the kneading. In Mexico this process is the regular norm, since tortillas are the main staple on the Mexican diet. you can find places where tortillas are made fresh everyday or the tortillerias which they are also made fresh by a machine, and people line up everyday in the middle of the day to buy fresh tortillas. It is hard to settle when you know the real flavor and texture of a tortilla, being on the states it is more common to find the pre packaged tortillas at supermarkets, which they are far in flavor and texture from the real tortillas. This recipe attempts to recreate that warm, soft, toasty corn flavor that tortillas have when just made out of the comal. Despite the fact they are made from corn Masaharina, the results are much closer to the flavor ant texture of a real mexican tortilla. On the recipe you will find variations and different brands of masaharina. I suggest to follow the instructions and try to find the brand I recommend, for best results in flavor and texture. You can easily find this brand online, if you live abroad, might be easier for you to order online. This handmade tortillas last about 3-4 days if they are kept on a plastic bag on the refrigerator. How to Reheating next day? No problem!.. My dear 50%Scottish- 50%American husband taught his 100% Mexican wife to reheat the tortillas on the bachelor way: In a toaster. Would you believe?!!! Ha! Well I have to say that it is a very effective method. What I learned is that by sprinkle them with a little water on each side, then place one tortilla into each toaster slide, set up the toaster number 3-4 depending on the toaster and you will have the most efficient and fast reheating method for tortillas. The tortillas turn out warm and not dry. Be careful using your fingers to remove them, they get very hot. Thank you Ian, but of course for a Mexican the first choice would be a comal, or over the flame on a gas stove to heat them. This char the edges, giving them extra flavor. Makes about 12-14 / 4” little tortillas. 1 plastic bag (see photos below for instructions). *If you are in Austin, Tx you can buy fresh masa at the Milagro Factory on 6th st. Ask for fresh corn masa, not the one that is prepared for tamales, make sure to specify you are making tortillas. 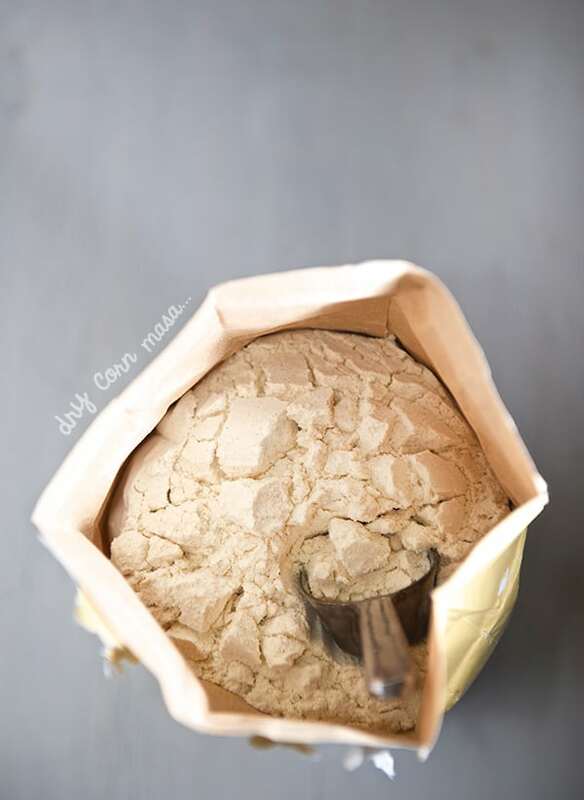 If you want to make your own masa… well that is a whole other process… I will work on that… soon : ) ! However If you don’t find fresh masa, dry masa harina is a good choice. Minsa brand, and Arrowheads Mills also offer this type of masa harina. What is special about this masa-harina? Well it is the process of Nixtamalization, which dates from the Aztecs back in 1200-1500 B.C. 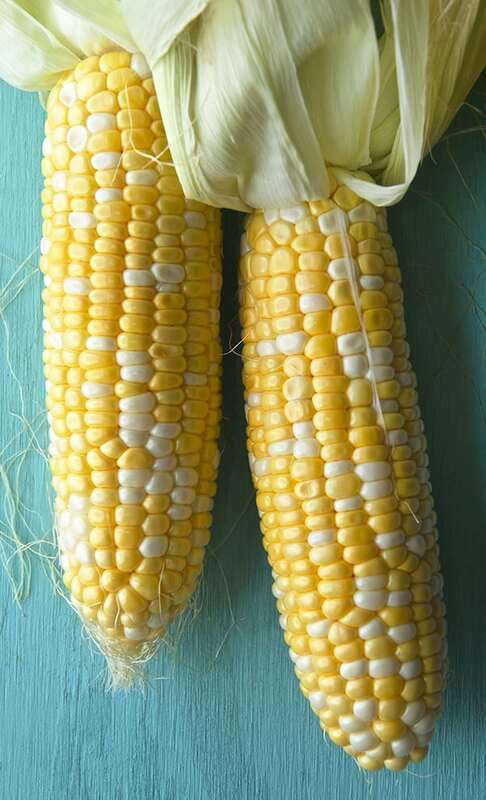 In this procces, dry corn kernels are soaked and cooked in an alkaline solution, made with limestone and water, which helps remove the outer hull of the grains and pre-cook the corn kernels. These corn kernels once are soaked and rinse several times, are grinded, added water, a bit of salt and transform into fresh masa. The brands I previously mentioned are dehydrated masa transformed into Masa-harina. Masa -harina its a very common alternative when there is no access or time to make fresh masa. My best advice is to check with your supermarket, in the international food aisle, today a lot of supermarkets have a “Hispanic food aisle” and if you are abroad, your best bet is to order online. I included my favorite brands at the end of this post. 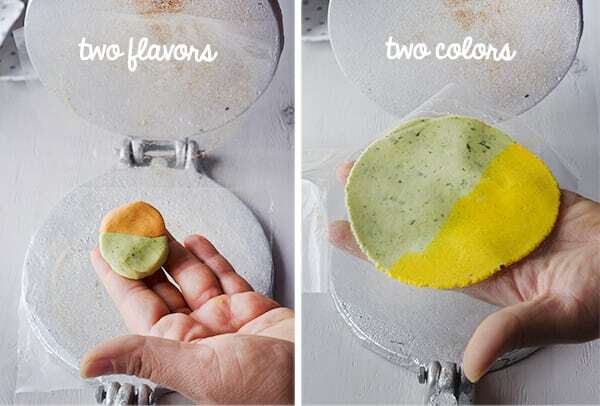 Organic options are suggested at the end of the post, If you are using Organic dry masa harina I will recommend to use 1/2 cup minsa + 1/2 cup Organic white masa harina, for better texture and flavor. Use measuring cups for better results. 1. Start by dissolving the kosher salt into the warm water, On a large bowl place 1 cup of masa-harina, mix and make a well add the water in the center and star mixing with your hands little by little until you have a soft ball and all the flour is incorporated. Kneed for 2-3 minutes. Make a ball and cover the masa with a damp towel or plastic wrap let it rest at least 20-30 minutes, let the masa-harina re-hydrate as longer as possible. Usually after this period you need to make some adjustments. Too dry: it will start to crumble, you need to add more water. The right texture resembles a moister play-dough. It is ok for the masa to be a little humid to the touch. Making tortillas is a matter of feeling the masa, the more you make them the better you will get at it. Your masa has to be always room temperature (except if you live in Yakutsk, hehhehe), slightly warm to the touch works best. 2. After 30 minutes, prepare the resealable bag, by cutting the top sealed lines of the bag and cut open the 2 sides of the bag. Now you have like a plastic folder. 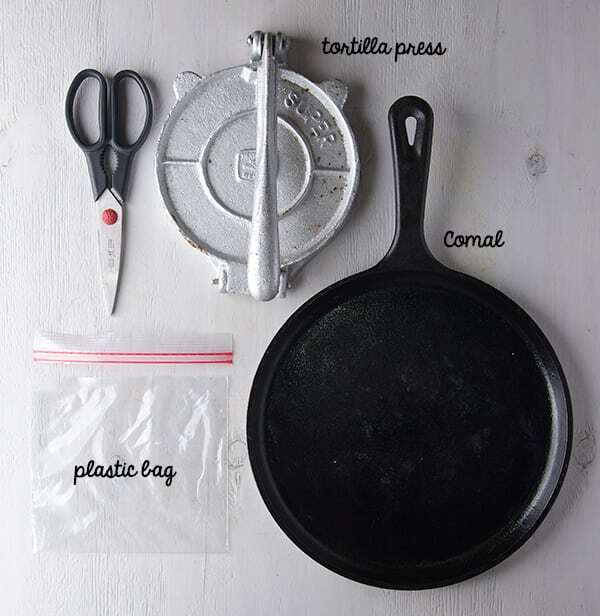 Open the tortilla press and put a drop of oil, then lay down the plastic. This will prevent the plastic from moving while pressing the masa. Now, Start by making 1 ½” round ball (you can use a small Ice cream scooper to help make them even size). 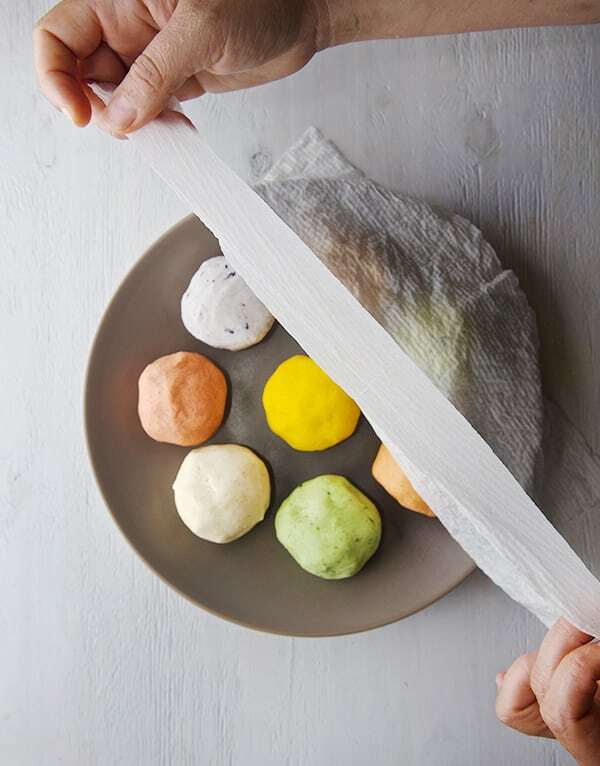 Remember to Keep your masa covered with a piece of plastic wrap or damp towel at all times to prevent from drying out. 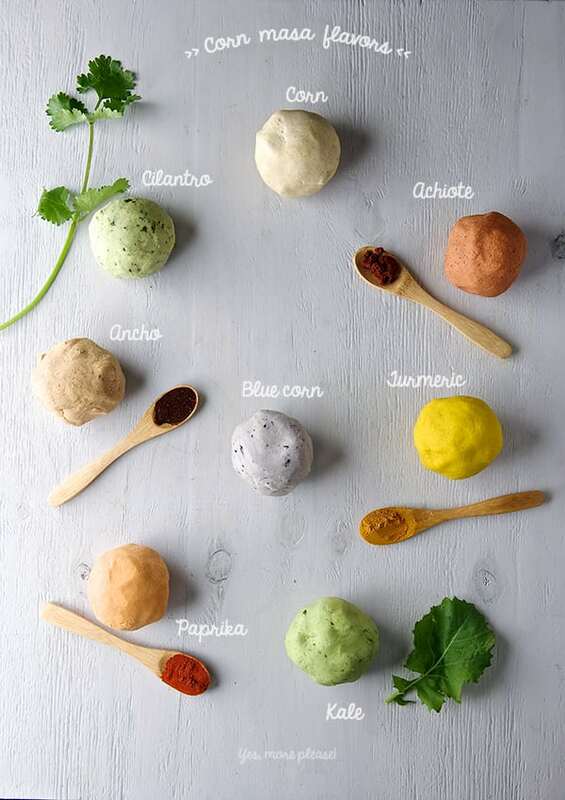 Work with one ball of masa at a time. 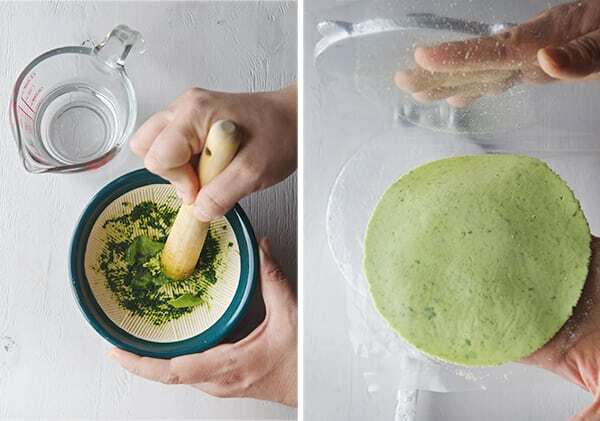 Now, place the masa ball in the center of the opened plastic and flatten slightly with your fingers. Fold the plastic over the masa, and fold down the metal tortilla press. Hold the handle and press down gently until the dough has spread about 4” inch diameter. Rotate the plastic and slightly press if necessary. 3. On medium-high heat, heat up a large cast iron pan, a griddle, a comal, or a teflon pan will work too. With your hand, hold the tortilla in the plastic, and carefully peel the plastic just like if you where peeling a sticker. Once one side is peeled, flip it into your writing hand and peel the rest of the plastic. As you peel allow the tortilla to rest halfway on your hand, and half hanging down. Gently lay down the tortilla on the warm skillet. Once you place it Do not try to reposition!, you just have one shot!…. 4. 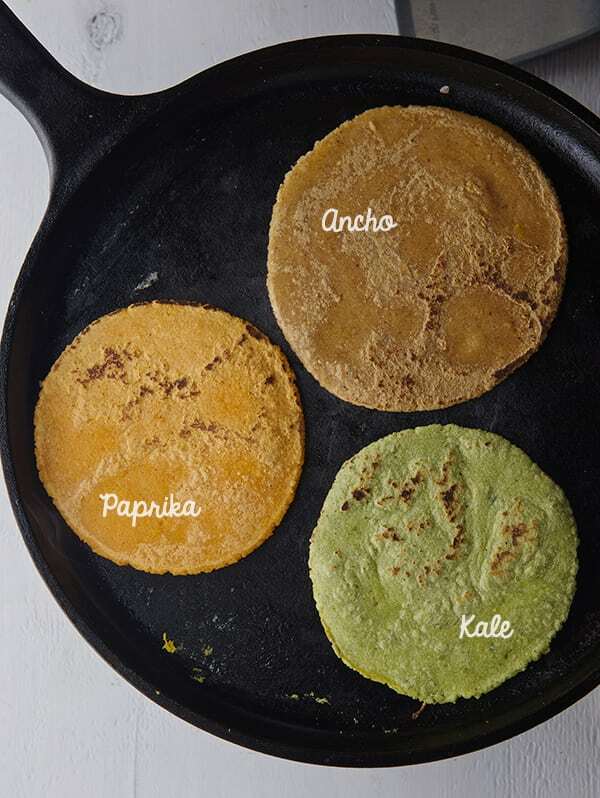 Using a flat spatula, flip the tortilla until the edges start to release from the skillet. Once it releases easily, then its time to flip. You should not battle the flip if it does not release with ease, just give it a bit more time. Usually it takes 30-40 seconds per side, especially with these little tortillas. Once you flip you can press down a little on the edges. After you laid the tortilla on the pan, 2 flips its all it needs. 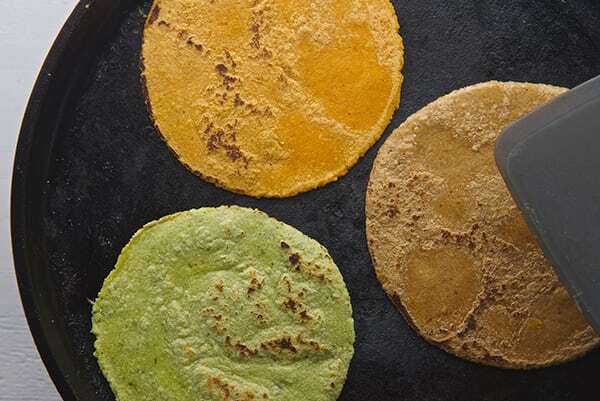 The tortilla should be lightly colored and air pockets will form on the second flip. As soon as the air pockets are forming the tortillas are done. Transfer the tortilla into a tortilla warmer lined up with a clean cotton kitchen towel with a dry paper towel on the bottom to keep them moist. Keep them warm in a tortilla warmer until you finish with all the masa, working one ball at the time. Depending on size you can fit 2 or 3 on a 12″ skillet, and once you start getting a good tortilla rhythm its fun and the process goes fast and smooth. Feeling a little whimsical? Why not adding an extra punch of flavor? 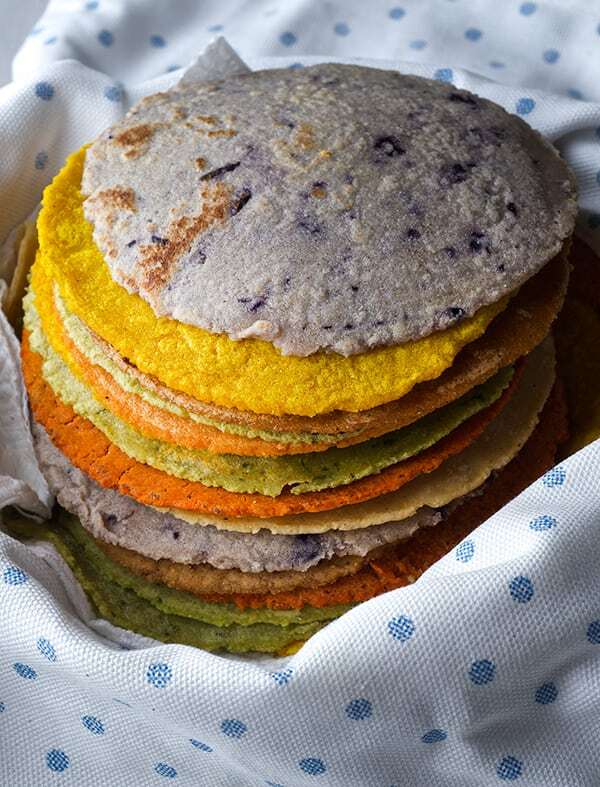 these variations using chili powders, spices and vegetable purees help a lot, especially when you are using dry masa-harina. They are a great variation and make amazing quesadillas or any taco of your affection. Add one of the following to the dry masa, and then proceed with the recipe, adding the water little by little, specially for the purees, you might need to add less water to the masa. 2 tablespoons of Achiote paste dissolved into the meassured warm water. 5-6 sprigs of Cilantro, remove the stems and smash the cilantro in to a paste, stir into the measured warm water. 1/4 cup packed baby Kale or lacinato kale, remove hard stems and smash the leaves into a paste, (you can use a immersion blender to make the puree) stir puree into the measured water. 2 guajillo peppers boiled, pureed and strained to remove the seeds. Other flavors: Tomato paste, Any other chile, like guajillo, chipotle, jalapeño, poblanos, spinach, sweet corn, sesame seeds, pumpkin seeds, Texan’s and New Mexicans : Hatch chile into the mix will be the the bomb!. Just Follow this principles by adding a powder or a paste. * First tortilla is always a disaster, do not get discouraged, learn from it. * Feel the masa; t0o wet will stick to the plastic and won’t release, to0 dry, it will crack, and won’t hold together. * When cooking: Too hot griddle will char the tortillas with out cooking them through, too low temperature, will dry out the tortillas before they are cooked, and they won’t be pliable and soft… This temperature issue is the same when you are making pancakes, the first pancake its always a bad one until you bring the pan to the right temperature, …then you are on the right track! * When making tortillas: Masa and tortillas don’t like to be rushed or people in a hurry. Get into your tortilla Zen mode first, once you get the tortilla rhythm you will start having fun!…and eating them too heehehe! * Practice my little grasshopper, practice, because once you get the hang of it there is no comparison from homemade/handmade fresh tortillas than the store bought…that is a fact Jack! 1. Minsa Masa Harina, one of the leading brands in Mexico, has recently made a great commitment by completing all the certifications USDA organic, NON GMO, Kosher, GF, WHole Grain, and GFSI. This makes this brand my first choice when making tortillas from dry masa harina. Its now available on the USA. 2. The closest option I found is a brand named Gold Mine Natural Food.co, they sell Non-GMO, organic, BLUE masa harina. They just started to carry 1lb. bags. for a fairly good price. If you have a big corn tortilla commitment go for the 50lb. bag and share it with your friends hehheeh. Down side is you have to order on-line or ask on your nearest Whole-foods Market if they can carry in stores. Here is the link to their website. 3. Bob’s Red Mill- Masa Harina Golden Corn Flour. I tried this masa harina it has great quality and flavor, but it is made from yellow corn. The variety I’m used to is white corn, since I’m from the South of Mexico. Flavor its different, a little sweeter than the white. You can use as substitute in this recipe, adjusting the water, maybe up to 1-1/4 cups. This Flour its available on line and often found at regular supermarkets. It is with great sadness, and concern what is happening in Mexico. The government just passed a law that will allow to GMO Corn to be grown in Mexico. This could affect more than 59 types of heirloom corn. If you would like to know more about it and take action signing a petition to revoke that law, click here for more information ad supporting this cause, Save the CORN! 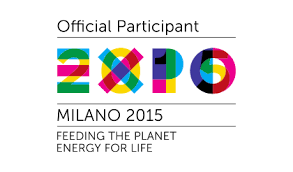 for more information about the cause Green Peace Mexico and ANAA the National Assembly of Environmental Affectings. After a rainy, muggy and wet Spring, Summer arrived early here in Austin. Temperatures are on the rise and bright sunny days with blue skies are here. Vacation time is upon us. This means get out of the kitchen!!! Enjoy the outdoors, and whether you are planning a vacation to the beach a picnic or a staycation at home, there are always ways to enjoy this great weather. This recipe is a fresh and light option, for gatherings, entertaining, or to take to a picnic or just to enjoy by the pool, patio or in the comfort of your house watching your favorite movie or reading a book. The goal is to relax and enjoy something fresh and delicious and pamper yourself. 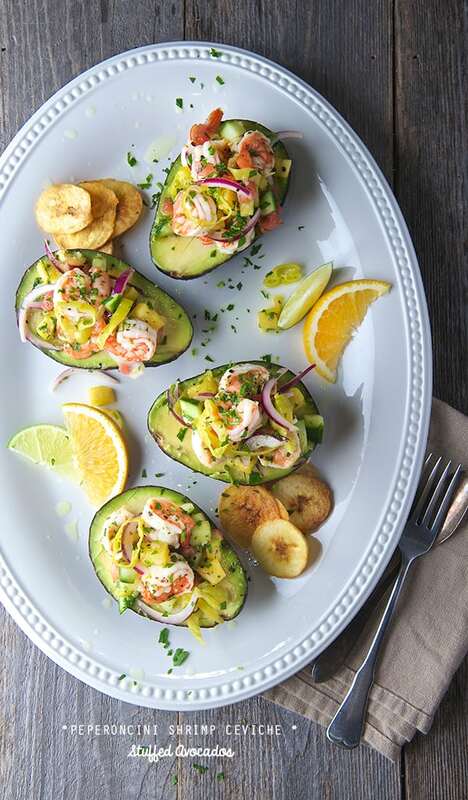 These stuffed avocados are a party on a plate. 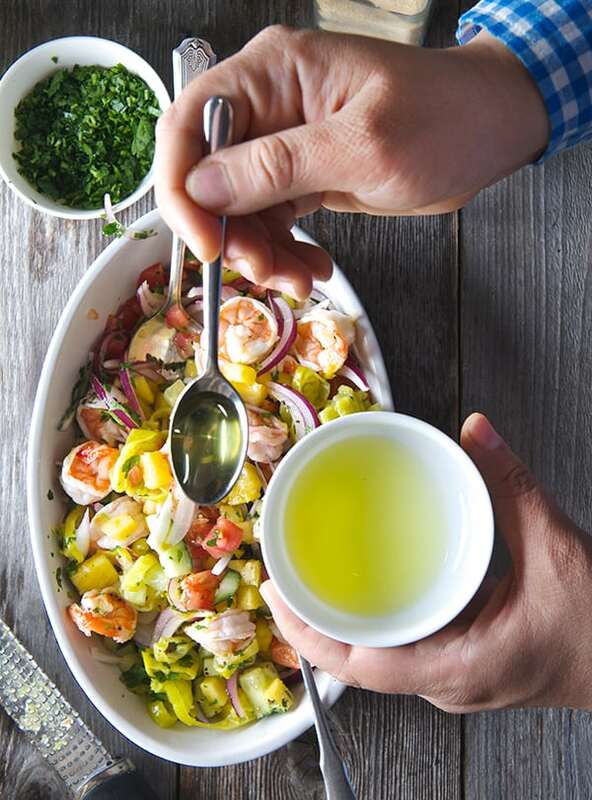 The Peperoncini Shrimp Ceviche is out of this world a punch of flavor, fresh, light and serving it on avocado halves makes it just irresistible. 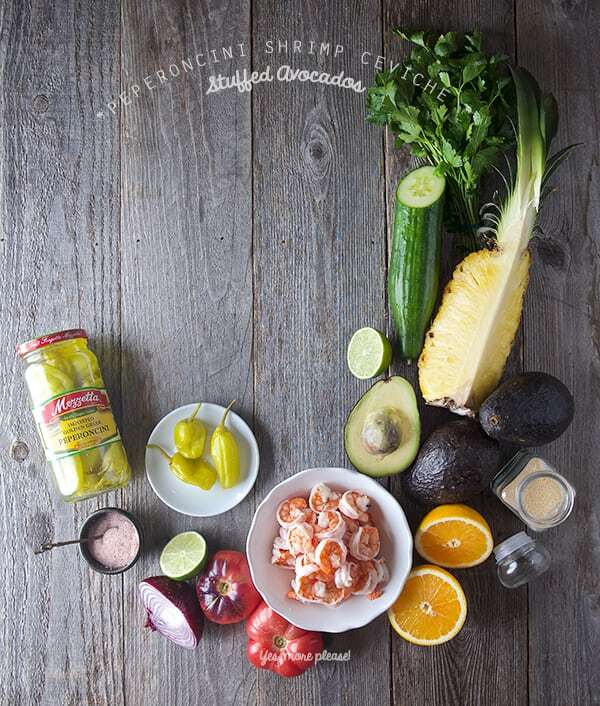 All the delicious summer flavors: cucumbers, pineapple, onions, limes, orange juice in combination with a pepper kick from the peperoncinis and the creamy avocado make this recipe a win win situation. Healthy? Yes, indeed. Fun to make? Yes! 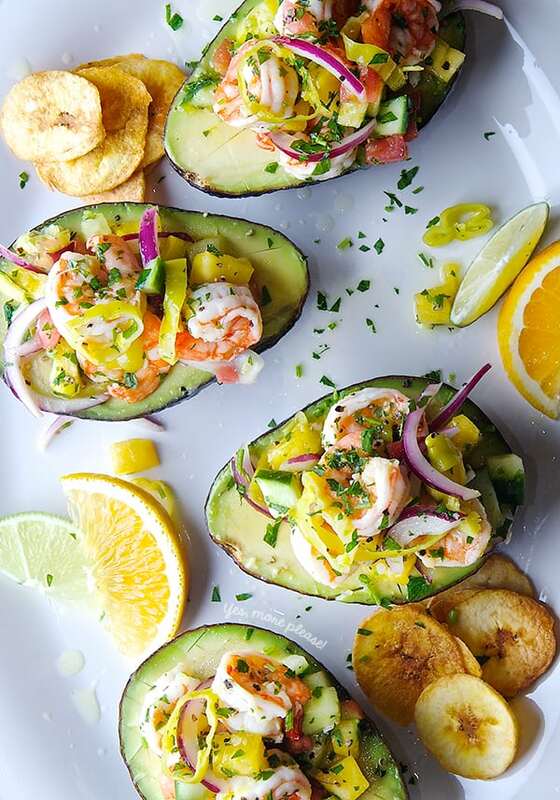 Peperoncini Shrimp Ceviche Stuffed Avocados It is just what you are craving on your Summer vacation. Good music, refreshing drinks, a relaxing attitude and these are all you need to bring the heat and enjoy your Summer vacation… Let’s cook! Serves 4 to 6 with a bit of left over to refill the avocado halves. 1 pound small medium shrimp peeled, deveined and cooked. 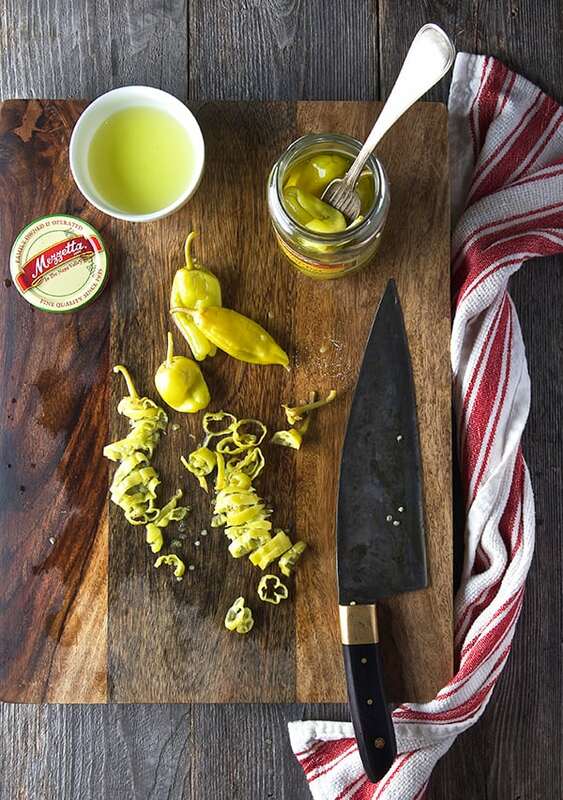 8-10 pieces of Peperoncinis sliced. 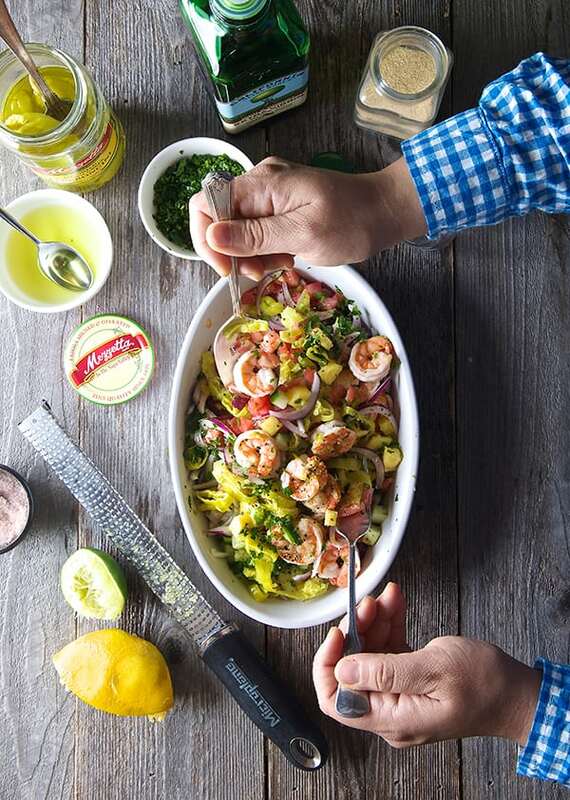 1.In a medium size bowl combine all the chopped vegetables, shrimp, and the sliced peperoncinis. 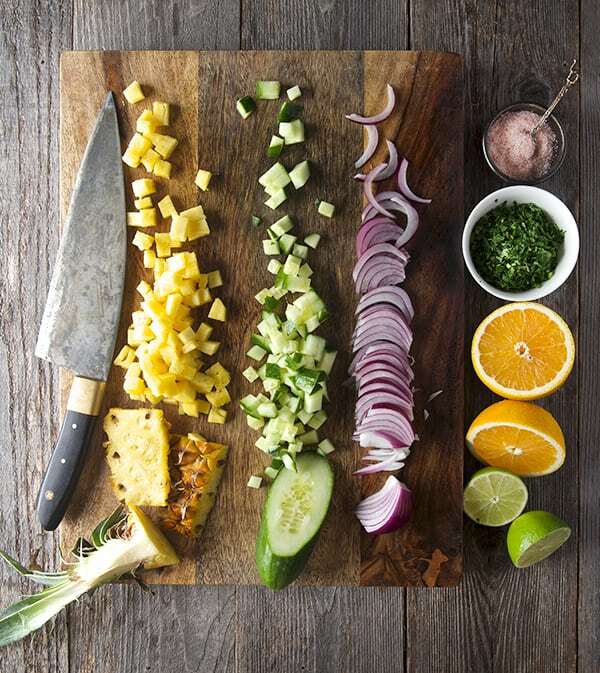 Add the lime juice, the orange zest and juice, 2 tablespoons of the peperoncinies brine, extra virgin olive oil, garlic powder, celery salt, Black pepper and one or two pinches of Pink Himalayan salt to taste. Toss throughly, cover, refrigerate and let marinate for at least 30 minutes. 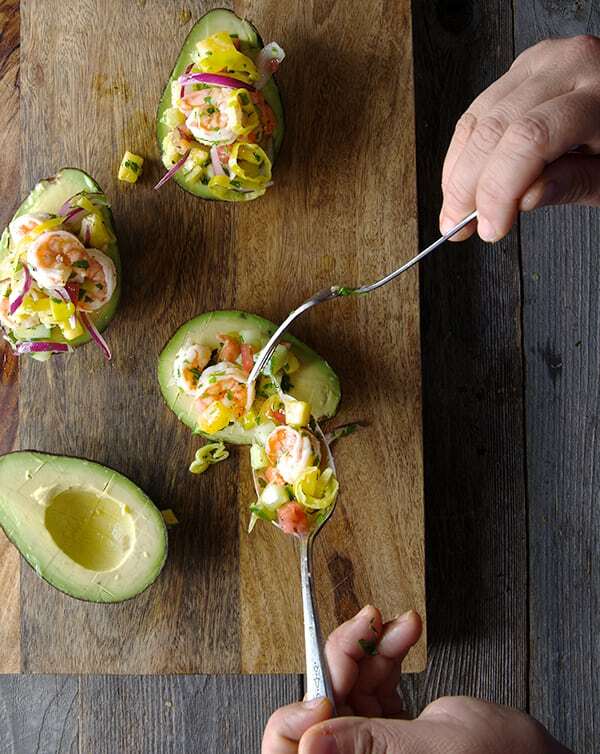 2.When ready to serve, cut Avocados in half length-wise, remove pit, and slice a sliver from the backside of each half to flatten the rounded side and make them stable on the plate. 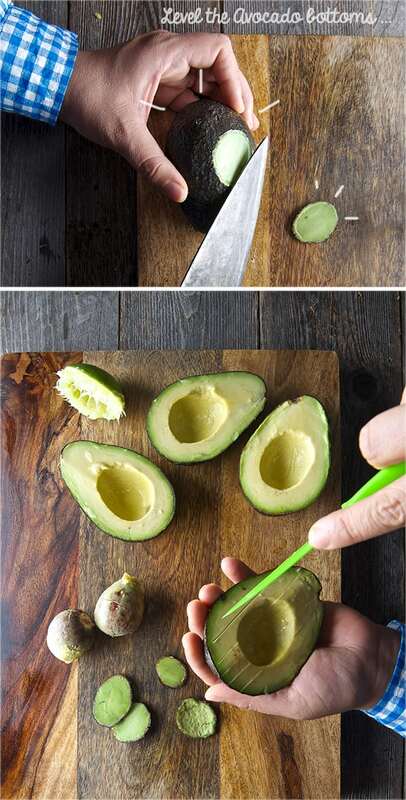 With a paring knife carefully cut the interior of the avocado into a grid. This will help to make it easier to eat. 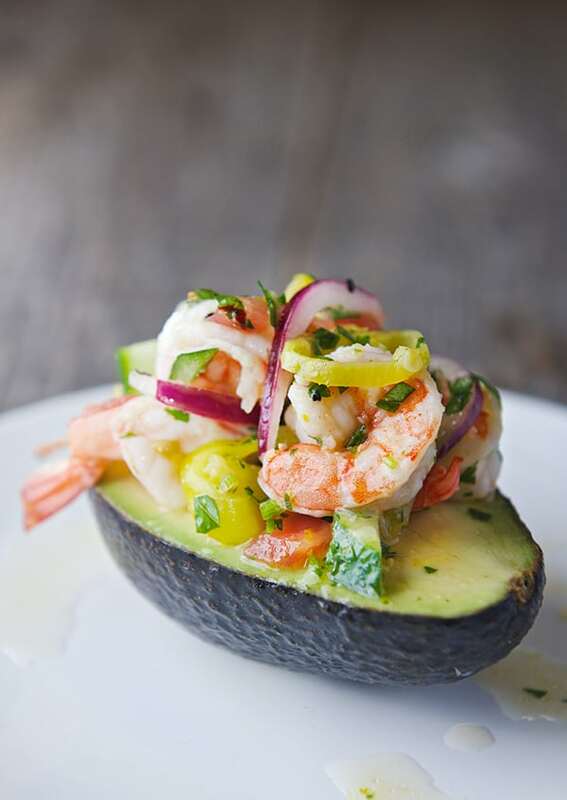 3.Drizzle some lime juice and a little pink salt, on each avocado half place them on a serving platter and stuff with the Peperoncini Shrimp Ceviche. Garnish with lime and orange wedges, plantain chips or water crackers, Enjoy! If you are on Vacation mode, weather if it is staycation, the beach, pool party or a picnic this give away is for you! Enjoy your Summer and Bring the Heat!!! 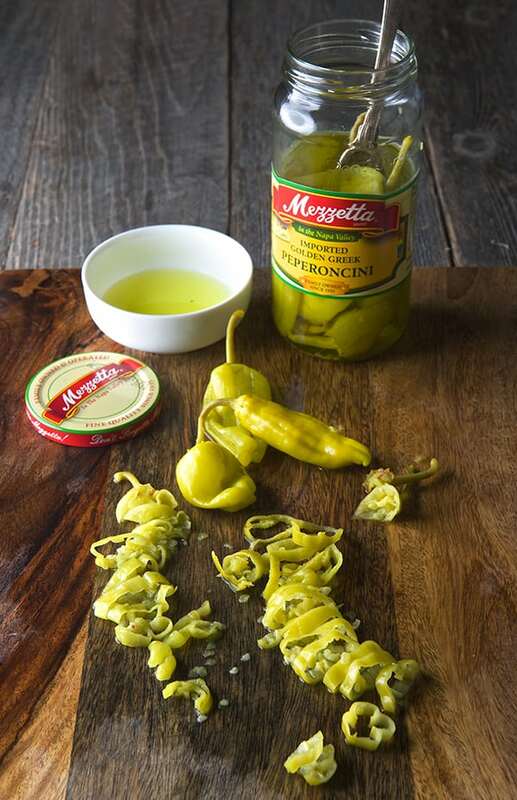 Thank you to Mezzetta for sponsoring today’s post and inspiring us to try your delicious peppers! This salad sums up summer in one plate. It is the kind of salad you eat and feel so happy and satisfied, sunshine on a plate. Fresh sweet corn and juicy peach season is here in Austin and I can have this salad almost every day until the last peach. If you are like me and bought two little baskets of peaches at the market, because one did not seem enough for your peachy desires, well we are in the same boat. The good thing is that extra peaches are not a problem once you get the hang of this salad.And if you still have some peaches left over, bake a pie, make this fantastic mini peaches and cream empanadas you have a good alibi for as long those peach baskets last you…. Let me describe you this salad. Imagine the flavor of fresh sweet corn crispy yellow kernels, in combination with juicy bright sweet tangy floral peach slices, a few pieces of pan seared golden Halloumi cheese salty, crusty outside, and creamy gooey inside, over fresh arugula and greens. All come together with a delicious sweet and tangy Lemon-Basil Vinaigrette. It is ridiculously good. It is. Because yes. 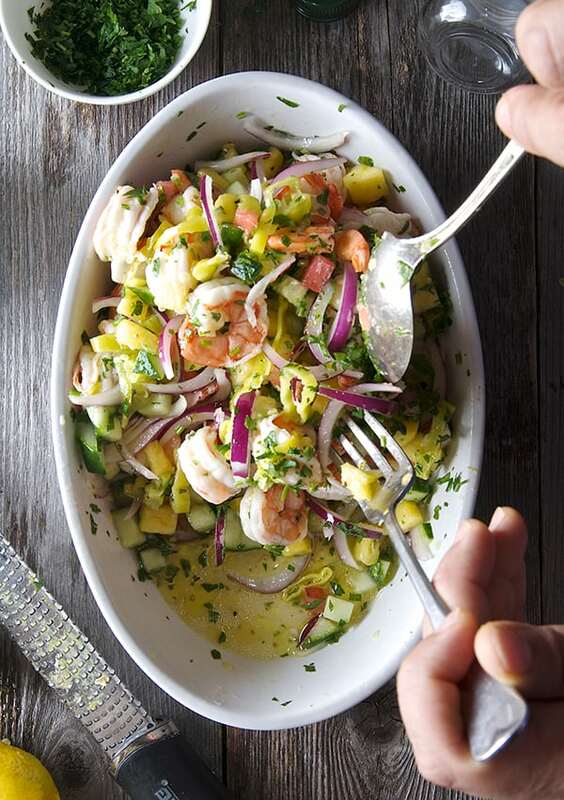 All the sweet, juicy tangy, salty briny, herb flavors together, one bite of these salad you are hooked! If you are not in Austin you must try to find a specialty food shop were you can buy this delicious cheese… Explore and try something new! 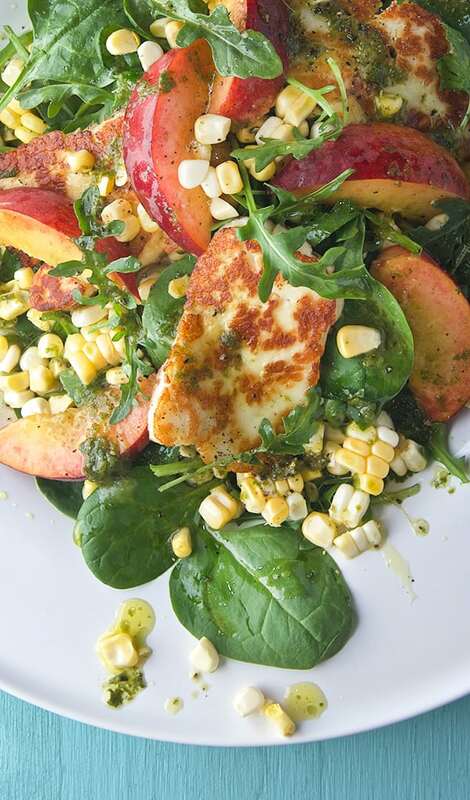 Get your inner peach and make this glorious Peach Sweet Corn and Halloumi Salad with Lemon Basil Vinaigrette fresh salad. Lunch, dinner or both, it travels great for a picnic on the park or to daydream about summery days at the office. 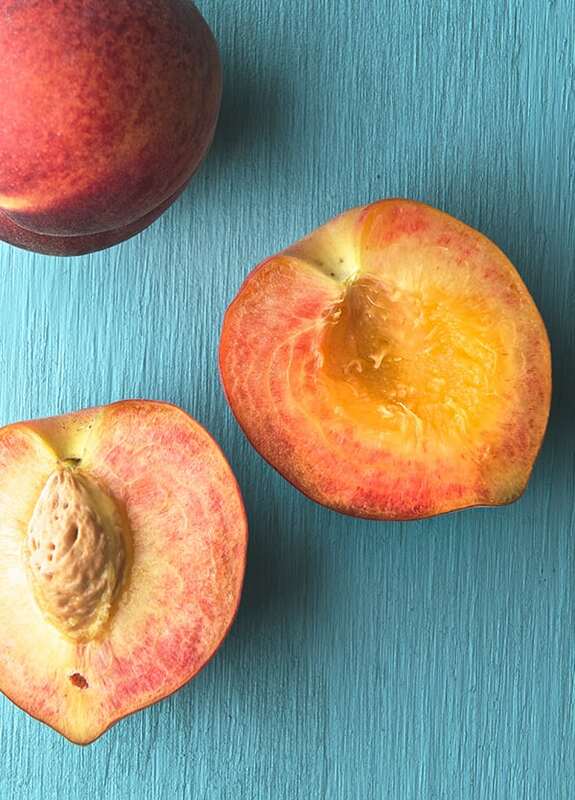 All you have to do is to close your eyes and almost feel your feet on the green grass, the sun warming up your eye lids and a warm breeze asking you is it summer time yet?….Run and get peachy now! Enjoy.